This was my first credit card on my journey to correct some credit errors I had made in my youth. I started off with a score in the high 500s, and Capital One granted me a limit of $300. Better than nothing, right? After about 6 months of responsible use, they raised my limit to $500. 5 months later, it was up to $1500 - the extra available credit helped me get approved for another card, and by then my score had gone up by about 75 points. Being that this is my oldest card, I still have it. I use it once every couple months to keep it active. My score is now over 700, thanks in large part to this card, which will always have a special place in my heart and wallet. Also - I find the app to be very user-friendly and simple to use. They update it frequently, and in the two years I've had a relationship with Capital One, I've not had a complaint about them. other at 500. I just began to make small purchases for a couple years and about every 6 months or so they would raise the limit slighty, by about 150-200 at a time, so very miniumal. This is NOT meant to be a reward card or carry many benifts. You have VERY basic benefits like travel insurance, auto collison damage waiver, no foreign transaction fees, and extended warranty. No points, travel or awards accure and this card typically (from mine and what I've reserached) carries a fairly high APR. My advice is get the card, get your credit in order, and move on to something else. I applied initially for this because of my approval odds. I have had the card for less then a year and have had no problems with this company at all. I have even had my credit limit increased already. Their app is awesome and makes payments super convenient for me. You just receive the card this year? This is a great card to have. Just by me applying and getting approved for the card my , first month of having it my credit scored went up 39 points. I am so happy to have this card. I have had no issues with this ard at all. I do suggest everyone should try this card. My payments post within a day. My advailbale credit is their for me within the next day. Greaat service. I will be standing with this company. They also have no annual fees . I look forward to getting their unsecured card in a few months. Dont know how that happened? Started off with $300, 6 months later went to $800, 6 months later went to $1300, and now I'm at $2300. CAP 1 dose like for people to make more than minimum payment. Maybe that's tour issue. I applied for this card in February of 2019, 1 year after filing bankruptcy with 2 capital one cards. Thought I would of been denied being that I only a a secured card from Discover with a $300 limit. Seeing that I also have a fraud alert on my credit profile I was not approved automatically. After going through the verification process to my surprise I was approved. 1 week later I got a letter in the mail stating I was approved for $3,000. 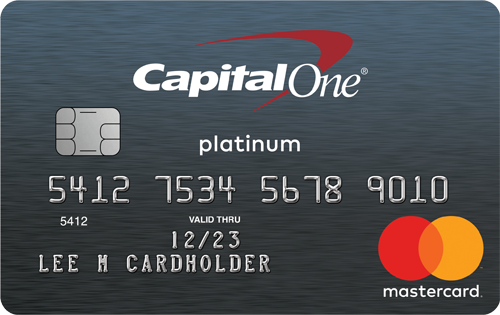 Capital One gave me not 1 but 2 chances to help build my credit! Waiting for my 5 months of on time payments to see what my credit line increase would be like. My credit score was 725 when I was repaying my school loans and when I paid the rest off in full last year, it went down to 636. I wasn't sure I would qualify for the card but I was and provided you pay off the balances in full every month -- your credit score goes up. (Now I'm up to 672!) No annual fee or rewards, but helps to establish a credit history and set up for applying for a better card later on. Started at 518. In 2 years with this card alone now 740 and also own a home. Always always always pay bill on time is my advice to credit card newbies. Regardless of the response for a cli, the actual people here can’t do anything for you. I was recently denied and tried calling to see if I could talk to a person and see if I could do anything immediately to get them to reconsider. Nope, the computer makes the decisions. What a joke.